In the summer of 2002 during an airshow visit at Wausau, Wisconsin, I had the opportunity to take this photograph. 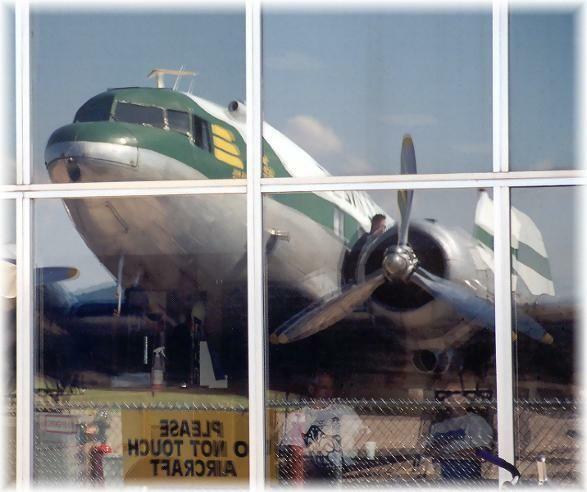 It is a reflection of our DC-3, N763A of the Prairie Aviation Museum in the terminal building. Aviation photography is another hobby of mine and to get this picture, we had to push the DC-3 about 100 yards nose-in toward the small terminal. It just so happened we needed to gas up and the tanks were nearby. You can see the reflection and, some folks sitting inside the terminal. Being a reflection, notice the yellow sign with back-to-front lettering.